Queens Community Board 2’s transportation committee voted 5-2 last night to support the DOT plan for protected bike lanes on Skillman Avenue and 43rd Avenue, overruling CB 2 Chair Denise Keehan-Smith. The full board votes on Thursday. Last year, after a driver killed Gelacio Reyes on 43rd Avenue as he biked home from work in Manhattan, Keehan-Smith called protected bike lanes on the street “necessary.” But when DOT unveiled its plan for 2.6 miles of protected bike lanes and pedestrian safety improvements on 43rd and Skillman, she balked. Calling the conversion of parking spots for safety improvements “highly unreasonable,” Keehan-Smith has made clear that she would like to nix the protected bike lanes. Her elevation of on-street parking over safer street design was on full display again last night, but most other committee members did not share her views and voted to endorse the protected bike lane plan. Keehan-Smith’s main strategy was standard stuff for street redesign opponents: insist the bike lanes go anywhere but the streets that are in line to get them. First she latched onto LaGuardia Community College’s call for protected bike lanes on Thomson Avenue. She then claimed that “a lot of people” felt that Northern Boulevard and Queens Boulevard should get protected bike lanes instead of Skillman and 43rd. 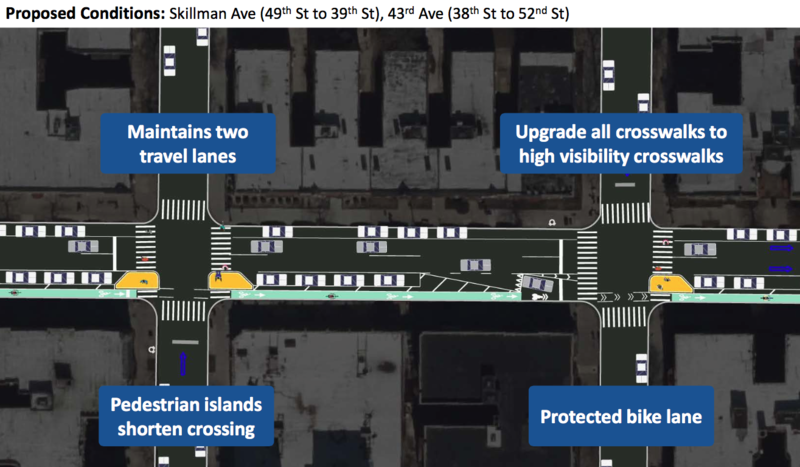 Even though 43rd and Skillman were chosen for this redesign because they’re direct feeder routes to the Queensboro Bridge bike path, with a recent history of drivers killing or seriously injuring cyclists, Keehan-Smith said that protected bike lanes would not have saved Reyes’s life, because the driver who killed him was drunk. She also said she was “hearing” Reyes ran the light, and argued that since Reyes was struck in an intersection, safety improvements should therefore be limited to intersections. After the committee voted in favor of the plan, Keehan-Smith wasn’t done. She insisted on a lengthy follow-up discussion of a competing resolution to study protected bike lanes on Northern Boulevard instead. Committee members called out the stunt. The project now goes up for a vote at the full board this Thursday. A statement of support from Council Member Jimmy Van Bramer could move undecided members and nearly guarantee that the project moves forward. But Van Bramer has so far refused to endorse the protected bike lane plan, even though he stood with Reyes’s widow at the intersection where he was killed and called for a protected bike lane on 43rd Avenue. Instead of endorsing the plan, Van Bramer has stood by while a repetitive procession of town halls, workshops, and community board meetings have delayed action. An inquiry to Van Bramer’s office this morning was not returned. The full CB 2 board meeting will be held this Thursday at 6 p.m. at Sunnyside Community Services, 43-31 39th Street. She then claimed that “a lot of people” felt that Northern Boulevard and Queens Boulevard should get protected bike lanes instead of Skillman and 43rd. Sounds like Trump’s “a lot of people are saying” bullsh*t.
She means nobody she thinks is important wants them. Not to sound too much like those angsty conservative types, but how much time and money are we wasting on these charades to second-guess experts in their fields in order to placate the change-averse? If it’s a cent it’s too much. I disagree. If we spend some time and money now to ensure that people feel heard, it can take some of the energy out that might otherwise feed a backlash. That’s not to say that we should yield to them, just that many of these folks care more about being heard than about the actual road markings. “Nobody I know wants them”….well at least five people you know voted for them. LOL! The thing is, one can have a community board process that allows people to be heard that doesn’t drag on for months and months and months. Allowing people their say is important, but there’s a point at which claiming to want to allow people to be heard is just another stalling tactic. That’s what’s happened here.